While a little out of the way, we had to make a stop near Asheville for the 4th of July. Joel was quite excited when his mountain biking app lit up with trails around the campground. I managed to get a trail run in with my running buddy. It always puts a smile on my face seeing him teeter-totter down the trail like a puppy. However, the biggest moment of our visit was Addie’s first mountain bike excursion with her dad. While terrified at times, she was quite excited about what she accomplished, “Momma, it was harder than any trail you’ve ever done”. I believe it brought tears to both Addie and her dad’s eyes. We were also able to get in a swim, although hazardous to our health, at the “lake”. After the second sighting of goose poop covered in maggots floating in the water, we decided to vacate the area. At least the butterflies seemed to enjoy the goose poop. 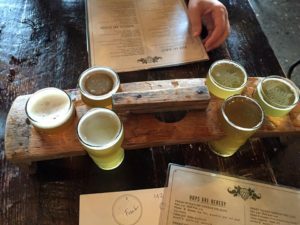 We couldn’t leave the Asheville area without venturing into town, in the RV, to eat at one of our favorite spots, Wicked Weed. Luckily parking proved to be less difficult than we thought. And we were all able to enjoy a hallelujah moment. 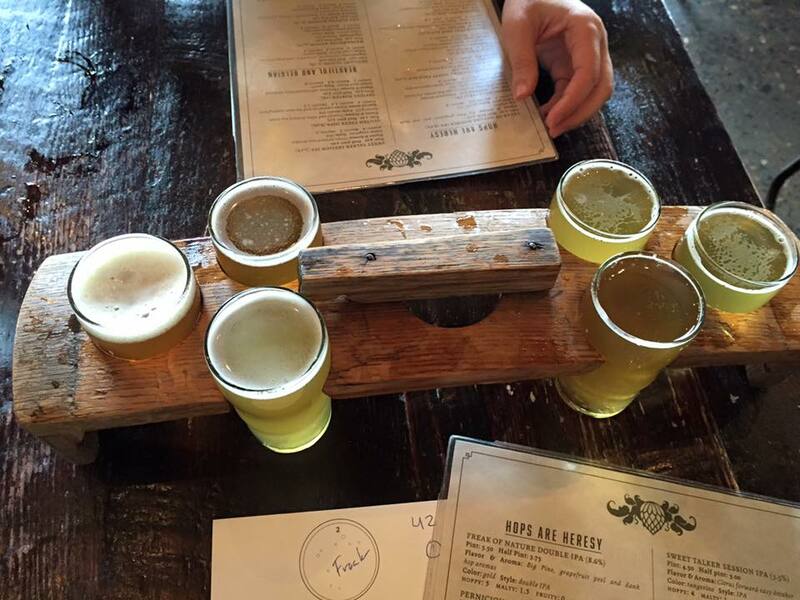 Always great beer and equally good food! Before making the long journey to Florida, we decided to hit the falls in Dupont State Forest. These are the famed waterfalls of the Hunger Games. While they are not anything close to the Niagara Falls, both of our girls are avid fans and any extra incentive needed to hike is welcomed. The hike down was a bit long and hot for the girls liking, but luckily we were rewarded with a nice cool dip in the pool at the bottom of one of the falls for a solid hour. Even Willy seemed to enjoy paddling around. We sold our house and the majority of our stuff. We bought an RV and work from the road, with our two kids and dogs. We encourage our girls to explore the world around us instead of the worlds they create in Minecraft.